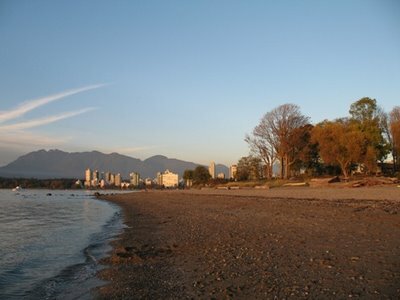 Life of Miss Sunshade - The Vancouver SuperDALE: I got MY beach back!! 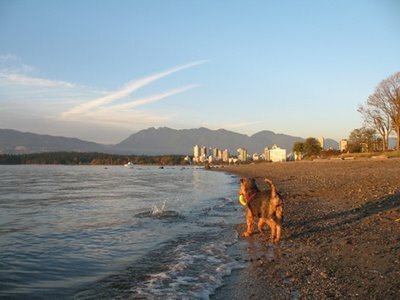 I'm a happy happy girl because once again, I'm allowed to play on the entire stretch of beach at Kitsilano Beach!!! The main beach is closed to doggies every year from April to October due to the fact that st*pid hoomans like to lie on the beach and be burnt by the sun. Seriously, what's wrong with them?? 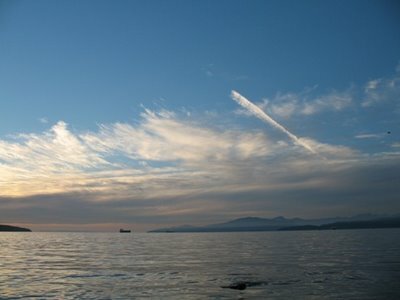 I was so happy today that for the first time since a loooong time ago, I was allowed back on MY beach!! I was also very happy because even though my mum did get into her "trigger happy" mode, I didn't seem to be her focus today (yes that's a good thing, trust me!). 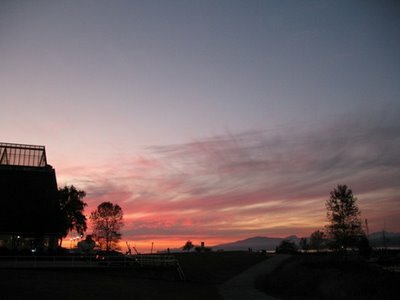 She took lots of pictures of views from Kits Beach. 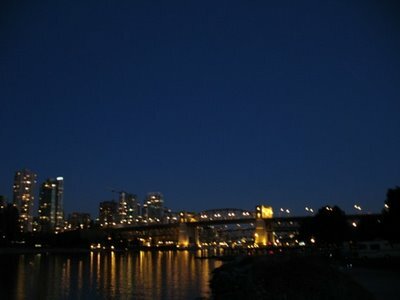 The following pictures were taken from relatively the same spot with a bit of a time lapse in between each picture. Ok, so I did have to pose once...... Is it me, or are my nostrils the same size as my eyes?? Maybe I need a nose reduction surgery? 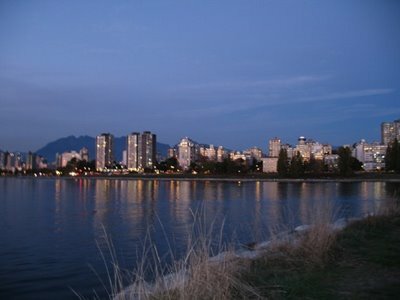 This is view from Vanier Park (part of Kits Beach) looking over False Creek to downtown Vancouver and English Bay. 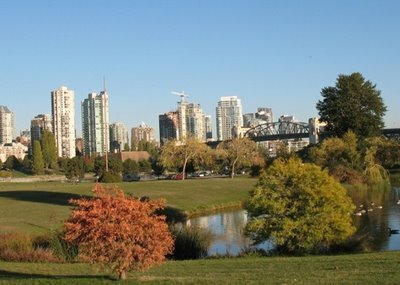 View of Burrard Bridge, a six lane bridge spanning across False Creek connecting Kitsilano to downtown Vancouver. Me having a couple of ZEN moments. 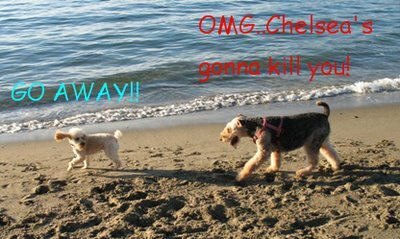 Finally, ACTIONS from the dog beach!! I couldn't believe my ears, so I HAD to go make sure myself. I thought maybe the media or his agents had gotten to him you know, kinda like the Michael Jackson thing, because the T-man I know would never do such a thing, especially behind his supermodel girlfriend, Chelsea's back. However, this blond T-man acted very suspicious, and he kinda had that guilty look on his face too. He kept moving away from me and not wanting me to get a good sniff of him because he knew I would recognize him!! It all made sense, since Chelsea and I are good friends, he didn't' want me to find out and tell Chelsea about it. Of course I didn't think what he did was right or necessary to becoming a star, but being the good friend that I am, I wasn't gonna tell on him. Instead, I decided to warn him since I know how Chelsea likes her man black!! But then this blond guy got all rude to me, told me to GO AWAY, and he actually sounded a little sissy. Right there and then, I knew I had the wrong guy all along. My friend T-man has manners. He would never have told me to GO AWAY even if he was blond, and he, would NEVER sound like a sissy!! NEVER! So I ignored him and played with my ball-ball!! BUT...... for some reason, everybody wanted my ball...... I mean, just look at them, don't you think they're all trying to get my ball?? Mum thinks I was being paranoid, but I know I was RIGHT!!! I don't go after other dogs' toys, so I expect the same from other dogs. See....HE GOT MY BALL (while I was chasing off some other dogs who *I* thought wanted my ball too!!). So who is being paranoid?? sunshade, in the first video, they seem more interestd in you than your ball. while in the 2nd video... did that evil dog give you back your ball after he snatched it from you? 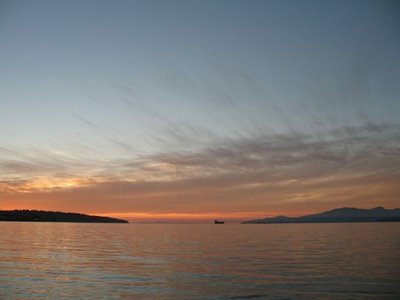 btw, those photos are really scenic. i wish there's a beach here that i can visit and play with mom and dad. You must not let your ball out of sight!!! I usually sneeze on mine. That seems to keep the others away from my toys!! hey sunshade, those bubble share are very useful. thinking to get one for myself too! 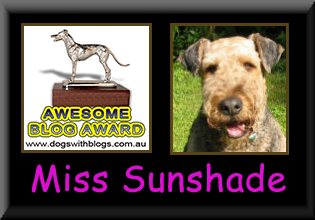 Great pics Miss Sunshade - that looks like a really nice beach. I am glad you can go there again. You're right! My supermodel girlfriend would probably disown me if I went blonde, even though I might have more fun :) Plus, since I'm a natural black, maintaining a blonde bod would be both costly and a nuisance. My mom has enough trouble keeping my ears tangle-free without worrying about dark roots. 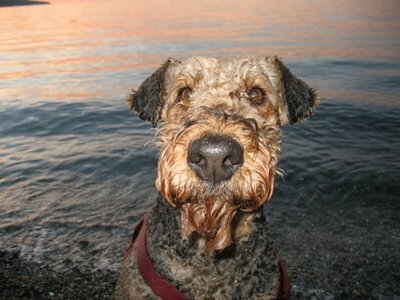 And who's that doggie spreading rumors of me on the beach? 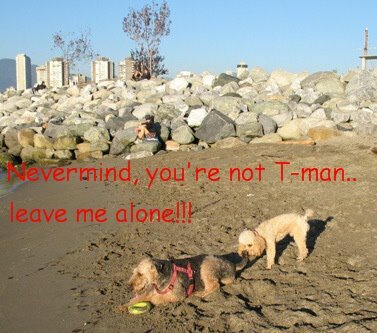 At least that blonde poodle got to play on a beach, while I was shivering from cold here! And, yes, I would NEVER tell you to go away. I would be thrilled to finally meet my blogging friend!! By the way, I love your banner with your baby pictures!! Isn't that "ball" a "ring?" Cool beach. Wish I had a beach. You are sooooo lucky to have your very own beach, but maybe your mom needs to post signs saying that to keep the other doggies away from your ball. I love the T-Man story line. That was soooo funny, hee,hee!!! You keep close watch on your ball from now on, O.K.? Glad you like the BubbleShare. Your mommy did a great job with it and I'm so happy you have a link to me on your site. That's what we're all here for...to help each other! glad you got your beach back. Nice beach Sunny, and beautiful baby pictures. Is it my imagination or were your spots darker as a baby? Don't worry about your nose. You have beautiful eyes and velvety soft nose. Your mom just took a wierd-assed picture of you. As Mom would say "user error!" snicker. I'm anxious for you to see my first lesson. I'm sure with my tutelage you will be come even more scary to strangers. 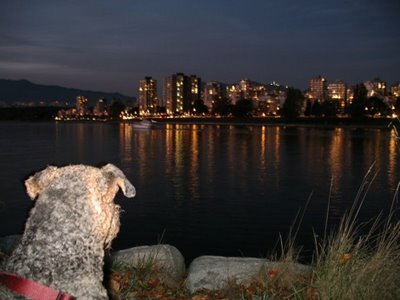 One of my humans is applying for a position at UBC! 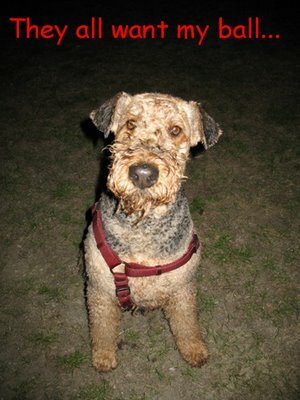 I think it's a long shot, but maybe someday we can frolic in the surf together. 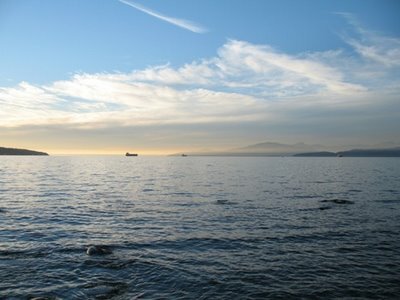 Your beach is so beautiful! We sure wish we had a beach here to run along. Don't you dare get a nose job! It will make your face look all stretched out funny like those hooman movie stars. 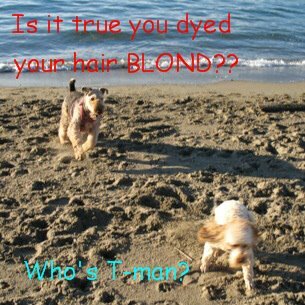 T-man would never be rude to you girl, that blonde was an imposter for sure! and keep those doggies away from your ball! 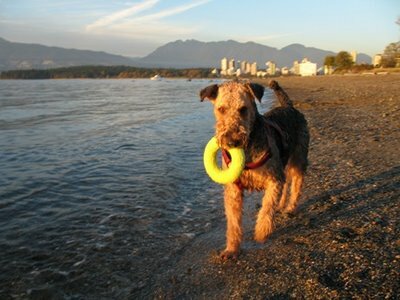 Personally, I would love to join you for romp on the beach & I would happy to share my ball with you! Booboo: mum actually thought that evil, annoying dog was funny! She said he was pesking everyone and the owner couldn't do anythign about it. I on the other hand didnt' think he was funny at all especially it took his owner forever to get my ball back!! Aren't those bubble share the coolest? I stole the idea from Roo. Can't wait to see yours up!! Hey you Trio: Thanks for the compliment, I'm just happy that it was me mum was snapping away at. Funny, I am listed with Cinemazoo too. Fufu: you are so RIGHT. It should be named the Sunshade Beach since I'm there everyday!! Opy Opy: long time no see!! Yeah I'm so glad I got the whole beach back! 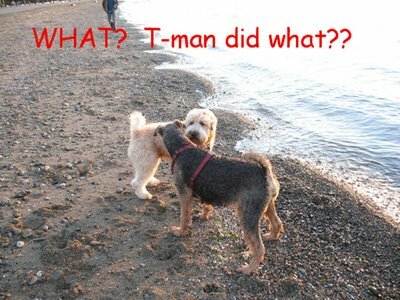 T-man: I'm so sorry about mistaking you for that blondy. I know you would never tell me to go away, you are a REAL gentleman, that's why a REAL lady like Chelsea has her eyes on you. So happy you like my baby pics! Copper: yes...it is indeed a ring made out of tennis ball material...hehe! Chiyo: Really, no nose job?? The rolling picture slide thingy is really cool, I can't wait to see yours up!! Roo my idol: yeah I'm gonna try my best to keep my ball-ball close to me..... Thanks for the inspiration on the BubbleShare. Mum absolutely LOVES your blog!! Yo Maxey: YUP, I think you'e right, it was "user error"!! Bad mommy!! Hehe...you are so observant, yes I was born almost completely black, and as I got older, the black started to fade. Of course, my sheep coats makes my colour lighter than usual as well. Hey Lenny: REALLY?? 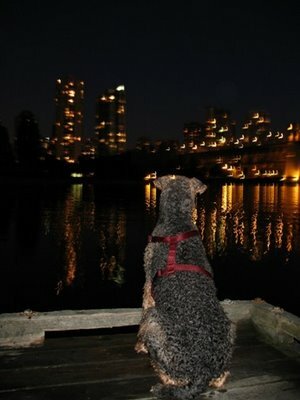 Your hooman might be coming to UBC?? Oh you are gonna love it here, and we can go "squirrel patrolling" the campus together!! I"m sure between the two of us, we will catch evil squirrels!! Joey: you read my mind!! Ball stealing dogs have no manners!! 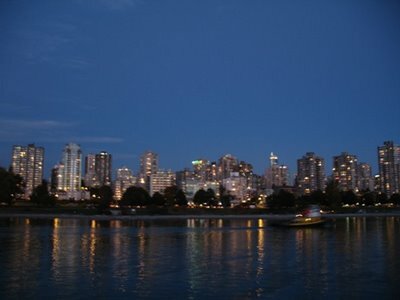 Hey Dean-O: mum and I only moved to Vancouver about 6 years ago, so we dont' really know about the real estate part. But we are really enjoying being in the Westend! 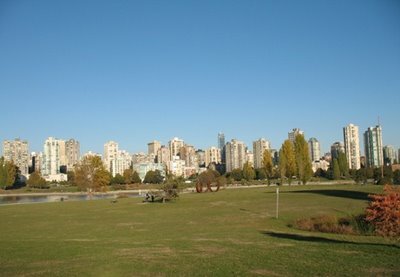 Is your mama originally from Vancouver?? Thanks so much for adding me to your link! !